An 808 and a 909 in a single box. Is it all too good to be true? The TR-8 captures the essential tone and mojo of the original TR-808 and 909 but takes it firmly into the future. A must have. Authentically captures the sound and feel of the original TR-808 and TR-909. Solidly built, with intuitive performance-orientated interface, all for under £400. 32-bit, 96KHz analogue circuit behaviour (ACB) modelling engine, with an output per instrument over USB. No ability to record parameter changes. Lacks track solo and undo functions. The TR-8 might not look vintage, but it does look good. You don't get physical outputs for each drum instrument, but you can send each one to its own channel in your DAW. The backlit knobs and faders are designed to help you in low-light situations. It's been fascinating watching epic analogue vs digital debates develop all over the web since Roland starting teasing us with glimpses of its new TR-8 and other Aira products around a month ago. 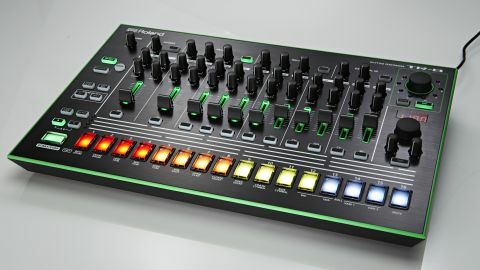 We've all been hanging on every word, picture and video clip that Roland has been serving up, hoping that rumours of a brand new TR-808 and 909 might be true. But what are Aira and the TR-8 all about? Firstly, Aira isn't an acronym. Roland describes it as "a product range aimed at DJ/producers who make their own music in a studio by day and then perform it at night". Now comes the burning question - is the TR-8 analogue? In a word, no. It's a digital drum machine that utilises Roland's new ACB modelling engine (Analogue Circuit Behaviour) that aims to faithfully recreate analogue circuits and the way they behave (ACB is nothing to do with SuperNatural - it's entirely new). "We also hope that the TR-8 helps put to bed the notion that digital can't sound as good as analogue when done right." Now, before any diehard old-school beatbox fans skip the rest of this review because the TR-8 isn't analogue, we should say that this new machine seriously challenges the notion that virtual analogue can't sound as good as real analogue. As such, it deserves your attention. We were more than a little excited to see the TR-8 in the flesh, and after frantically opening the box like men possessed, we were greeted by a sleek and futuristic-looking box with a black brushed aluminium front panel, day-glo green plastic trim, a plethora of knobs and backlit buttons/faders, and Jupiter 50/80-style multi-colour plastic pads. All the function buttons and faders are backlit green, which not only makes them look great but is very practical in dark lighting situations. Build quality is very solid throughout, and although the plastic casing is lightweight, it doesn't feel cheap in any way. The faders/knobs are also impressively tight and solid feeling - certainly better than most other products we've tested at this price point. All the controls are coated with a nice grippy rubber, too, which stops any finger slippage. We would have no hesitation throwing the TR-8 into a rucksack, taking it on tour and playing the hell out of it every night. The TR-8 Rhythm Performer is a standalone drum machine in the classic TR-808/909 mould, and although it's currently limited to models of 808 and 909 sounds (there are no samples onboard), there's a strong possibility that Roland may add more of its classic drum machine sounds/models in the future. This simply wouldn't be possible if the TR-8 was analogue. As the TR-8 has been designed with live performance as its focus. The front panel has an intuitive knob-per-function ethos that makes it easy for newbies to grasp, yet there's enough depth for seasoned beatmakers, too. There are some hidden functions, but these are generally of the 'set and leave' type and include MIDI settings/channel assignments, clock sync, MIDI Thru on/off for the MIDI Out port, sound routing options to the two assignable outs (there are four physical outputs in total) and output boost. Additionally, although there are only four physical outs, the TR-8 is able to output each of its sounds separately over USB. Simply install the driver, select the TR-8 as your audio/MIDI device and its outputs all show up in your DAW. It's possible to assign every instrument to its own output, so you can spread all of them over their own channels. There are a total of 14 outs available over USB (seven stereo pairs). On the front-left of the unit itself are the step and real-time recording mode selectors, plus kit select (there are 16 kits for mixing 16 808/909 sounds together) and an instrument select button. TR-Rec mode is the familiar step recording mode found on the TR-808/909, where you sequence up to 16 steps per instrument. To step record, simply press any of the 16 fixed-velocity drum pads (which turn red when active) then hit Start to listen. Alternatively, use the Inst Rec mode to record beats in real-time using the pads as the sequencer cycles. In Pattern Select mode, you can select from one of the 16 user-writeable patterns by hitting any pad. Each of these 16 patterns also has two parts with 16 steps each (A and B), and if you select the A and B buttons together, the TR-8 automatically chains them to form a 32-step loop. The Scale function from the TR-808/909 is also included, and lets you select from various triplet or straight feels (double-time, half-time etc). Changes to patterns/sounds/effects are also continuously stored and saved when you power down. Finally, there's Live Inst mode, where you can tap out beats while another plays back, and Last Step mode (also on the TR-909), which allows you to adjust a pattern's length by switching steps on and off. It's much like 'active step' on Korg's Volca range, and it's great for creating odd time signatures and fills. Simply hold Last Step, press the step you want to be the last, and when you're ready, hit step 16 to bring everything back in on the one. So, what's the verdict? Well, we think Roland has done a superb job. The build quality is way beyond what we were expecting for the price, and the ACB technology has captured the essence of the original TR-808/909 amazingly well. In fact, these are the most authentic emulations we've heard in the digital domain, especially as the sounds aren't static and subtly change on each step. Of course, there are small differences in sound compared to the originals (the most obvious being no hiss and perhaps a little less dirt) but generally, the models exhibit few of the downsides often associated with digital emulations and samples (such as lack of warmth, aliasing/noise at extreme tuning levels, brittle highs, flat sound etc). As a live performance box the TR-8 is totally addictive and the workflow is super-fast. Every control and function is instantly accessible, and there's no reliance on a screen/menu system either - a good thing, in our book. Whilst the TR-8 feels largely complete, there are still some missing features that would further enhance workflow, and we're hopeful that Roland will be able to address some of these in future OS updates. In an ideal world we would like to see an instrument solo function (currently, you have to mute out all parts manually, or pull down 10 faders to solo one part), a revert/undo option, DAW pattern backup and a way to set how many beats/bars you want to play before a pattern switches (as things stand, you have to wait for the pattern to complete a full cycle before it switches). We'd also like to see the addition of internally sequenceable knob movements, along with the ability to record and recall these movements via USB. Right now, it's not possible to sequence sound changes and knob/fader movements on-the-fly and feature them in your patterns when the TR-8 is used standalone. You can't yet tweak and record, for example, the tuning on the snare and have it play back. Furthermore, although all knobs and faders do output CCs over USB/MIDI and it is possible to record their movements on-the-fly into your DAW, the TR-8 doesn't yet respond to the recorded MIDI from the knob movements. In other words, although the the CCs are recorded, the TR-8 doesn't receive the data back. We assume Roland can fix this in a future update. Also, while you can copy beats, you can't yet copy patterns between the A and B parts. There's also no Song mode, but you can create arrangements by switching patterns manually. Importantly, everything works solidly with no crashing, and the TR-8 really is pretty unique at this price point. It's the only dedicated TR-808/909 emulator that features modelled sounds and such a hands-on interface. Let's also not forget the high resolution audio/MIDI interface with an output per sound over USB, plus there's something strangely reassuring about having a new Roland-designed, one-stop-shop for authentic 808 and 909 sounds at your disposal. We also hope that the TR-8 helps put to bed the notion that digital can't sound as good as analogue when done right. As an example, we tested the TR-8 alongside a DSI Tempest running its 808/909 samples and the TR-8's modelled sounds were more natural and open sounding - a testament to the ACB engine's quality. Of course, there will be those who snub the TR-8 immediately on the grounds that it isn't analogue, but we challenge them to try it before passing final judgement. This is one digital recreation that has to be heard in person on a high quality system to be appreciated. Crucially, the TR-8 does feel like a new classic in the making, and Roland has shown that it now has the technology to faithfully model its iconic drum sounds. We have no doubt that it will fly off the shelves.